U.S. and Canada only entrants // Must be 18 years or older to win. Mia Sheridan is one of my favorite authors—her innate ability to draw you into her stories and fall in love with her characters is as impressive as it is addictive. As soon as I’m done with her books, I’m already clamoring for what she’ll give us next. 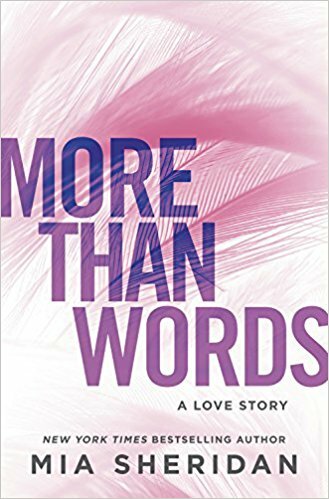 Her latest, MORE THAN WORDS, imparts a beautifully written, intensely felt story about second chances, and I’m thrilled to share an excerpt with you today! MORE THAN WORDS is out June 12th. ENTER TO WIN 1 OF 2 PAPERBACKS OF THE BOOK BELOW. I heard the ding of the elevator and stood, my heart picking up speed as I watched to see who got out in the lobby where I…well, where I’d been sort of loitering in a corner for the past hour. An older couple stepped out, and my heart sank but then lifted again when I spotted Jessie behind them, looking at a pamphlet of some sort held open in her hands. She was dressed in jeans, a loose white top, a pair of sandals, and she had a large purse over one shoulder. Her long brown hair was pulled into a ponytail like the night I’d kissed her in Paris, and she had a pair of sunglasses perched on her head. I cleared my throat and fell in beside her as she began walking toward the front desk. “Yes, always. Best part of the day. I never miss, er…” I searched my mind for what happened before noon. “The sunrise?” she offered, amusement lacing her tone. She looked at me sideways, clearly skeptical, and I couldn’t help smiling. She was so pretty. Those big hazel eyes, full lips that I knew tasted sweet, and a light scattering of freckles that I could only see when I was close. Very close. I leaned toward her and she leaned away. “Where are you off to this morning?” Jessie asked. “But…we could create new memories. Better memories.” I gave her my best seductive smile, but it only caused her eyes to narrow with disapproval. My smile slipped, and I felt strangely chastised. She put a hand on my arm as if in comfort. “Thank you, no.” Then she turned and walked away from me for the second time in twenty-four hours. She turned again and walked to the curb, where she took her cell phone from her purse, glanced at it, and dropped it back inside. “Half the women of the free world is a bit of an exaggeration. Forty percent, forty-five max. I don’t take a single one for granted.” I brought out the big guns, smiling, sort of lopsided, the one I knew women went crazy for. But once again, apparently not this one. She tilted her head as if she was trying to figure something out. “Funny,” she muttered, drawing out the word, though she didn’t sound amused at all. She took a few steps forward, tapping her foot and looking toward the bend of the long driveway, as if impatient for her ride to show up. A shuttle bus pulled up to the curb, and she headed to it. I paused for a moment, telling myself I should walk away. But my feet had a mind of their own, and they followed Jessie, stepping onto the bus. She was already sitting, and her eyes widened when she saw me. She pulled her sunglasses down and looked out the window. I took the seat across from her, putting my own sunglasses on. An older woman took the seat next to Jessie, and they struck up a conversation in French. I stared out the window, wondering what I was doing. I’d never chased a woman in my life. Much less to a museum. This was either a new low or a new high; I couldn’t tell which. Jessie was standing in front of a huge portrait of an angel smiling down on a young girl, and she glanced at me quickly and then turned her attention back to the art. She spent another several minutes looking at that painting, and I pretended to be interested in the statue next to me, resting my hand on its head and feeling one shell-shaped ear beneath my fingertips. The stone was rough and had broken away in a few spots. I wondered idly how one went about carving figures from rock, when the ear suddenly came loose and dropped with a small ping to the glass surface below. I froze. Jessie, who had turned from the painting and was strolling to one next to it, looked my way just in time to see me grab for the piece of broken ear, bumping the statue and causing it to rock dangerously. I sucked in a breath, steadying it, and Jessie put one hand over her mouth, her eyes going wide with alarm. My breath wheezed out between my teeth as the statue stilled, and I stuck the ear in my pocket, looking over my shoulder to make sure no one had seen what I’d done. The security guard standing near the front looked at me suspiciously, shifting back and forth on his heels as if considering whether to come over to me with some warning or another. “At least it’s a nice day for a stroll.” She paused before glancing away. “I guess we’re going to spend some time together after all. Excerpted from MORE THAN WORDS by Mia Sheridan. Copyright © 2018 by Mia Sheridan. Reprinted with permission from Grand Central Publishing/Forever Romance. All rights reserved. This sounds so good – I can’t wait to read it!! OMG! How I love Mia Sheridan and this upcoming release will be as brilliant as all her other books! Mia is one of my top favorite authors. I can’t wait for this book!! I cannot wait to read this! Mia Sheridan is SO good! Archer’ s voice is one of my all time favorite books. So excited to read More Than Words. I love Mia Sheridan and everything she writes! I love Mia Sheridan! Can’t wait for this one! ಌThank you for the excerpt and giveaway chance, ladies! I CANNOT wait! Mia Sheridan is an all time fave, buy without needing to read the blurb-author of mine. I LOVE all her books! I love Mia Sheridan just the expert alone makes me wanna click! Love Mia’s books, can’t wait to read this!! I love second chance love stories, this one sounds so interesting!